We invite families to sign up for the icon of the Divine Mercy. The peregrinations of the icon of the Divine Mercy to the homes of our parishioners, which started on Sunday, February 13th, continues for the fourth week. May this peregrination embody our efforts to prepare for this momentous occasion of the 115th Anniversary of our Parish. As we also anxiously await the beatification of Pope John Paul II, the promotor of the Divine Mercy, we pray for our parish and our families. We hope that all the families will accept the icon of the Divine Mercy into their home. >>> Please read more about the peregrination in the earlier blog. John Paul will be beatified on the Divine Mercy Sunday! 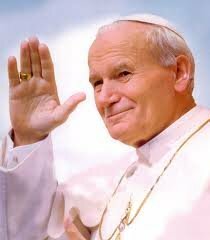 The much-anticipated beatification of Pope John Paul II will take place on May 1, the Sunday after Easter. The healing of a French nun with Parkinson’s disease was officially recognized as the miracle that made John Paul II a “blessed.” The title is given to martyrs and other Christians to whom a miracle has been officially attributed, thus bringing them one step closer to sainthood. Pope Benedict XVI approved the decree for the beatification of his predecessor during a Jan. 14 audience with the head of the Vatican department for saints’ causes, Cardinal Angelo Amato and promulgated the decree with his signature. LET US TOGETHER GIVE THANKS TO GOD FOR THIS WONDERFUL NEWS!!!! On Sunday, April 11, 20101 we celebrate the Divine Mercy Sunday. Devotions will be conducted in the English language at 3:00PM in the lower church and in Polish in the upper church. W niedzielę 11 kwietnia obchodzimy Święto Miłosierdzia Bożego. Zapraszamy na Nabożeństwo ku czci Miłosierdzia Bożego, połączone z Koronką do Miłosierdzia Bożego, które będzie odprawione o godz. 15.00 w j. polskim w górnym kościele oraz w j. angielskim w dolnym kościele.